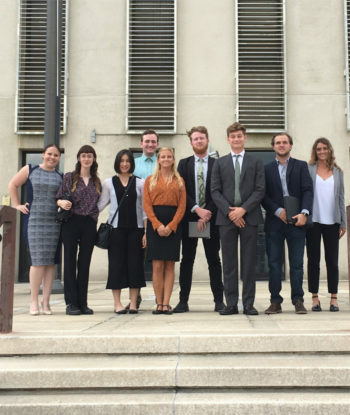 Each Florida legislative session, the Florida Ocean Alliance, a coalition of research institutions, coastal and marine business interests, and conservation groups, organizes “Oceans Day” in the state capitol building in Tallahassee, Florida. If you happen to be in Tallahassee next week, the event will take place on April 2nd. Young voters visit Florida’s capitol to ask their elected officials to take action with regard to the state’s grave wastewater issues. Oceans Day has always been an extremely important event that celebrates Florida’s magnificent coastal and ocean resources, while educating elected officials about the tremendous ecological and economic goods and services that our water resources can provide for us—if we take care of them. Given the pollution-driven algal blooms that recently devastated our inland waters, coastal waters, and many local economies, Oceans Day has never been more important. It’s no coincidence that this year’s theme is, “Preventing Coastal Economic Losses: How to save Florida’s water resources.” Our failure to protect our waters and ourselves from pollution and contamination, and the sluggish pace of Everglades Restoration, has made Florida a place that people are rightfully afraid to visit. Let me tell you a story about a recent VIP visitor that tells us a great deal where the “Fishing Capital of the World” stands in the national sportsman’s eye. Mid-March, my friend and former colleague Andrew McKean, who is now Editor-at-Large for Outdoor Life magazine, spent a week fishing in some of the state’s most famous waters, while interviewing leaders in the fishing industry, as well as scientists and policy experts, about our water woes. Though he caught a 40-pound redfish in the Mosquito Lagoon and an 18-pound snook on fly in the St. Lucie River, the story’s angle will not be anything like, “Hey, come to the Sunshine State and catch the fish of a lifetime.” In truth, even though he was fishing with the best guides on their respective waters, Andrew spent full days on the water just to get a handful of shots at a handful of fish. Hours of staring at bare, muddy shallows will instead probably inspire a cautionary tale for the rest of the nation about what happens when you fail to care for the waters that fundamentally drive a state’s economy. Yet knowing Andrew well, he’ll probably portray the fish he caught as symbols of the hope that it’s not too late for Florida to clean itself up and repair its ecosystems, which it isn’t. Yes, there’s something left to save. And so, as we approach Oceans Day of 2019, following a year that most sportsmen will remember as “Toxic 18,” let’s take a look at what the state’s poised to do, and what else needs to be done, to repair Florida’s fisheries, protect the federally managed species they support, and restore its reputation as the Fishing Capital of the World. Republican Governor Ron DeSantis ran on a platform that he would make Florida’s environment his highest priority. Thus far, he’s fulfilling his campaign promises, especially by requesting that the legislature authorize a whopping $625 million for environmental restoration, including $360 million for Everglades restoration projects, $150 million for “targeted water quality improvements,” such as sewage and stormwater infrastructure upgrades, and $50 million to clean up Florida’s unique springs. Thus far, the legislature seems enthusiastic about accommodating that request as much as budget limitations allow, but fishermen of all stripes should let the Florida legislature know that you demand clean water via the funding and accountability needed to get us there. The Everglades funding will significantly help four of the state’s most important estuaries, including the southern Indian River Lagoon complex, Florida Bay, the Ten Thousand Islands, and the Caloosahatchee River watershed, which include Pine Island Sound. It will go toward the completion of three dynamic reservoir systems and elevating the Tamiami Trail, a road that acts as a dam across the southern Everglades. The reservoir systems will remove nutrient pollution from a variety of origins, which fueled the toxic, chartreuse Cyanobacteria blooms in Lake Okeechobee that spread to the coasts, as well as the red tides on both coasts. The reservoirs will also provide reliable water storage so that we’re better able to send clean water at the right times in the right amounts to ecosystems that need it. That’s critical for fisheries production, in terms of encouraging seagrasses and bivalves, generating an ample forage base beginning with shrimp, and in terms of producing strong numbers of state-managed species, such as redfish, spotted seatrout, and snook, as well as federally managed species, including most species of snapper and grouper. Rep. Fine and Senator Gruters introduced strong companion legislation that would levy a $2 fine against utilities for every gallon of raw sewage spilled. The utilities would then have to use or lose the fines for repairs and upgrades. The bills would also require utilities to inform their customers when a spill occurred, while providing the name and contact information for their local elected official in charge of the utility. The bills also ensure funding for wastewater infrastructure upgrades. Senator Debbie Mayfield (R-Melbourne) and Rep. Holly Raschein (R-Fl Keys) also introduced comprehensive wastewater legislative packages that would provide funding for wastewater improvements, deadlines, and consequences for missing total maximum daily load (TMDL) nutrient-pollution reduction targets, watershed basin by watershed basin. I am cautiously optimistic that the legislature will pass legislation that includes big enough “carrots” and sharp enough “sticks” to spur major wastewater management reforms. 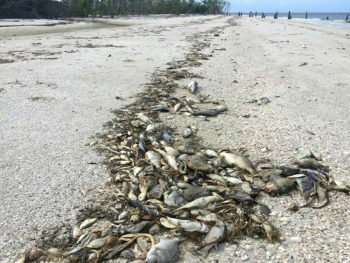 Red tide causes tremendous amount of fish to die and wash up on Florida beaches. A few years back, a well-meaning Florida Fish & Wildlife Conservation (FWC) Commissioner convinced fellow commissioners to liberalize commercial and recreational spotted seatrout limits, and do away with the wintertime closed season that protected the fish when they’re in tight aggregations in the warm, deep holes. To be fair, a recent stock assessment showed that the regional fisheries were in good shape. But, the decision rubbed many anglers like me the wrong way, because the commission did not seem to consider other impacts to the fishery, such as the wholesale loss of seagrass in the Indian River Lagoon and Caloosahatchee River complexes, or the probability of another catastrophic red tide fueled by human-caused nutrient pollution. I literally wrote the book on spotted seatrout, and scientists had pounded it into my brain that seatrout are extremely dependent upon seagrass and oyster habitats for food and cover. Meanwhile those habitats were disappearing before our very eyes. And the red tide and Cyanobacteria blooms of 2017-18 killed untold trout, redfish, and snook along the Gulf coast shallows. I’ve watched the trout fishing in my home waters of the Indian River Lagoon go to hell. We’re mostly only catching bigger fish, a sign of poor recruitment, and the fish are concentrated in the few acres of remaining seagrass, hugging the remaining mangrove shorelines, or sitting snug under manmade structure, especially docks. This habitat compression has increased pressure on the stocks in increasingly smaller areas. Not good. Thankfully, FWC made temporary catch-and-release only zones for snook and redfish in areas affected by the red tide on the Gulf side, from the south side of Tampa Bay down to Naples. Anglers may not harvest seatrout over 20 inches in those areas, either, which is a great move in terms of protecting the adult breeding sows, which represent a minority of the population. We also need to think about forage fish when we set seasons and limits. A few years ago, I worked with a coalition of conservation groups including the Pew Charitable Trusts, Florida Wildlife Federation, and International Game Fish Association, to convince FWC commissioners to pass a resolution making forage fish management a priority. I hope that the commission will direct staff to take that resolution a step further and think about what losing significant numbers of forage fish species to red tide, Cyanobacteria blooms, and habitat loss means for the production of the predator species targeted by anglers and commercial fishermen. For example, the Indian River Lagoon has lost most of its seagrass, and thus, most of its pinfish populations. Pinfish, as I’ve written about before, are one of the most important forage sources for inshore predators, migratory species such as tarpon, and for pre-spawn reef fish offshore. Without that source of energy available, it’s possible that the big breeder fish are not getting the nutrition they need to reproduce as prolifically. To be far more polite than I really care to be, some short-sighted interests continue to advocate for more “flexibility” in terms of violating common-sense fisheries management practices, the most important of which are the science-based annual catch limits required by federal law. Some are even saying that the Gulf of Mexico Fishery Management Council and the National Marine Fisheries Service (NMFS) should liberalize limits and/or extend seasons on snappers, groupers or other species in the Gulf, because the red tide hammered the state-managed species so badly and people want to fish. What a colossally stupid idea. With the exception of red snapper, and the deepwater snappers and groupers, most of those species grow up in estuaries and/or nearshore habitats such as reefs. Red tide hammered the inshore Gulf waters that produce the lion’s share of Gulf grouper, as well as hogfish, mutton- lane- yellowtail- gray- (mangrove) snapper and cubera snapper. Even red snapper were likely affected by the 2017-18 red tide, since the juveniles settle in relatively shallow shell hash and rubble where the red tide and resulting hypoxic waters had an impact. We likely lost huge percentages of multiple year classes of those and other highly important species. Thankfully, because of the Magnuson-Stevens Fishery Conservation & Management Act, which requires science-based annual catch limits, and the multi-species spawning aggregation sites that we wisely put off limits to bottom fishing, there are relatively healthy brood stocks out there that can replace through time the fish we lost to harmful algal blooms. FWC, the Gulf Council, and NMFS need to work together to ensure consistency of regulations across state and federal waters. Second, the state—no, we all—need to stop supporting legislation that would weaken the Magnuson-Stevens Act. Last year, I was very disappointed when FWC supported H.R. 200, and the early iterations of the so-called “Modern Fish Act” that would have reopened the doors to serial overfishing, among other consequences. We need to accept science-based annual catch limits as the law of the land, and appreciate what they’ve done for us in terms of rebuilding and maintaining our most valuable stocks, including red snapper, all the shallow-water groupers, and king mackerel, among many others. We need to do a much better job protecting the forage base and adopt other ecosystem-approaches to fisheries management, including anticipating the consequences of harmful algal blooms and habitat loss. We all need to roll up our sleeves to protect and restore our home waters, by demanding hard-nosed penalties for wastewater and other pollution and ample funding for ecological restoration initiatives such as those authorized in the Comprehensive Everglades Restoration Project. For the sake of our fisheries as well as our own health, we must stop discharging raw or partially treated sewage into our surface and ground water. As I indicated above, the Florida legislature is considering some pretty strong legislation with big-dollar appropriations for restoration and water quality projects. We’re also asking Congress for $250 million annually so we can finally finish the authorized Everglades Restoration projects. And federal appropriators are also considering increasing funding for EPA and other programs that help communities upgrade their wastewater infrastructure. If you live in Florida, or visit the place, call the local state representative, state senator and local Congressional leaders to demand clean water, healthy ecosystems, and well-managed fisheries. Terry Gibson serves as Government Affairs Director for the American Water Security Project, which focuses on repairing and upgrading our nation’s sewage infrastructure, and is an outdoor journalist who publishes in fishing, hunting, surfing and diving publications. He recognizes his parents and public lands and water access for bestowing those skills.